Parents, do you have "math anxiety?" When your kids ask for help with math, do feel a little nauseous? Just hearing the words algebra, geometry, calculus and trigonometry are enough to make many students (and parents) go weak in the knees. Well, don't despair because here are free printable algebra worksheets, trigonometry homework help, calculus tutorials and online geometry lessons to help. 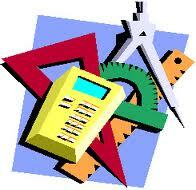 Links are included for free online scientific calculators and graphing calculators. Use these higher math tutorials, reference (cheat) sheets, tools and homework help online or print for home and school use. Start at Web Calc with free scientific calculators for homework help. This site has more useful online scientific calculators. Meta-Calculator has free online graphing calculators, statistics calculators, scientific calculators and matrix calculators. Check here for free scientific calculators, unit converters and financial calculators for consumer math classes. These sites have free math tutorials as well. Free math help has tons of math lessons and tutorials and free printable math worksheets. Click individual tabs for algebra, geometry, trigonometry, statistics and calculus. Each page features several free printable charts and pages of printable online tutorials, sample problems, references, explanations and study guides. Students can play online math games too. Webmath has math worksheets, printables and tutorials on higher math like algebra, trigonometry, calculus and geometry, too. Mathway offers online math tutorials and problem solving functions. Algebra math lessons provide homework help for logarithms, equalities, inequalities, formulas, equations, integers, exponents, properties, radical numbers, rational numbers, absolute value, quadratic equations, parabola, ellipse, hyperbola, circle, linear function, polynomials, factoring, square root and more. Geometry math lessons covers solids, spheres, cubes, triangles, angles, formula, Pythagorean Theorem, theorems, postulates and more. The trigonometry math lessons cover sines, cosines, tangents, Mollwied's Formula and all the various trigonometry functions and identities. Calculus math lessons cover integrals and substitutions.